An updated shop featuring some of my new and favorite pots is up on the Trad Meister webshop. Please stop by for a look if you have time. 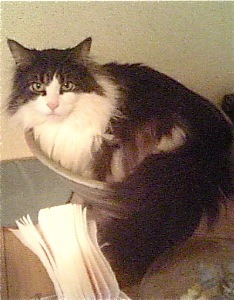 Spike is the official mascot and greeter for Ke-yaki Pottery. He attends nearly every event to meet all who stop by the Ke-yaki Pottery (ケー焼等芸) exhibit. 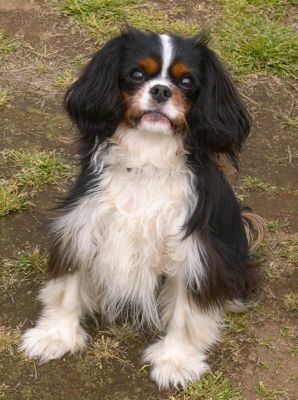 This coming weekend, June 5 and 6, Spike will be with us in the ケー焼等芸 tent at the Kasama, Ibaraki-ken, Michi no Ichi (道の市). Spike will be very happy to see everybody who visits the ケー焼等芸 tent in Kasama. This coming weekend, June 5 and 6, Ke-yaki Pottery, will be in Kasama, Ibaraki-ken, for the Michi no Ichi (道の市) craft fair. If you are in the Kasama area during Michi no Ichi, please look for the Ke-yaki Pottery (ケー焼陶芸) tent/display. Miho, Spike and I will be very happy if you stop by for a visit. My wife Miho, dog Spike, and I setup up the The Ke-yaki Pottery (ケー焼陶芸) tent and display at the crowded Matsumoto Craft Fair the past weekend. We were very happy to be there and thank all the many people who stopped by our display and made purchases. 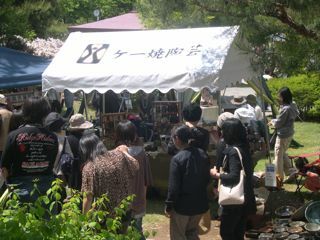 Below is a photo of our tent and display in Matsumoto. This coming weekend we'll be Nagano-ken for the Matsumoto Craft Fair. If you are in the Matsumoto area, please stop by the Ke-yaki Pottery (ケー焼陶芸) tent. We will be very happy to see you. Yesterday, I glazed some of the pieces that will be in the wood firing. I usually set up to glaze in the garden, lots of room, but it rained all day so I worked in some space under my kiln roof and in the studio. Hard rain is continuing this morning but I will begin to load the wood kiln in a little while and finish that today. The weather report says we'll have nice sunny weather after the rain stops today, which is very nice. I will finish loading the kiln this afternoon and start the wood firing at 5am tomorrow morning. One of my large bowls sits on our table and is normally filled with fruit. This morning it's empty and one of our cats, Scooter, moved in to relax. During March, I did a successful test firing of my new wood kiln. I was happy with the result and was able to learn much about how to fire the kiln. This week, I'm going to fire the wood kiln again, hoping for an even better firing. I will start the fire Thursday morning, continue Friday, maybe Saturday as well. Visitors are welcome on Thursday. If you'd like to see the wood firing in progress, please contact me through the Trad Meister shop, http://www.tradmc.com/index.html, and drop by for a visit. Yesterday I posted information about the event we will have at our friend's restaurant during Golden Week in Setagaya. The poster did not have directions so I'm posting an access map that shows where Daimatsu, 大松、restaurant is located. It is very close to Shoinjinjamae station on the Setagaya line. Please drop in if you have a chance. During Golden Week, on Tuesday May 4th and Wednesday the 5th, there is a show and sale of Ke-yaki Pottery at our friend's restaurant in Setagaya ward, Tokyo. Miho and I, plus Spike, will be there both days from 10am to 6pm. The restaurant name is Daimatsu. It is located on the shopping street close to Shoinjinjamae station on the Setagaya line. I redesigned and update my homepage, http://www.coenen.com. On the top page are links to Miho's blog, the fan page on Facebook, and online stores we you can purchase Ke-yaki Pottery. Hello everyone. I am happy to begin this blog with a posting about the newest kiln here at Ke-yaki Pottery. Last week, I finished building a new wood-fire kiln. This week I've been working on the final preparations for the first firing. This morning, I have just a few more things to finish then, after lunch today, I will load the kiln for the first "test" firing. I plan to light the fire tomorrow morning and then we'll see how well it fires. More about that later.